Dr. Hillbilly (far left) poses with The Iron Yuppie (far right). 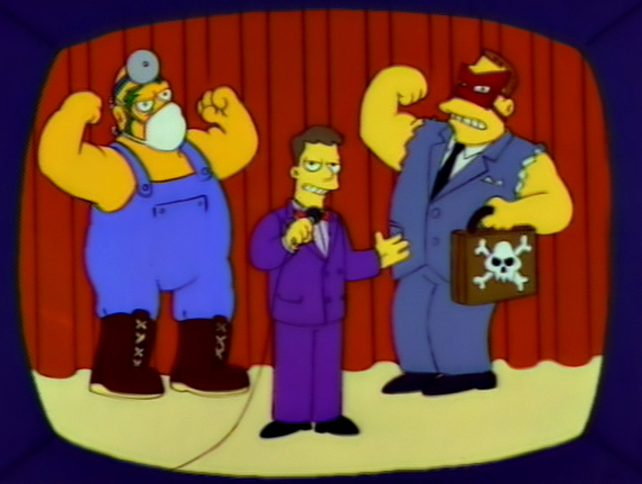 Dr. Hillbilly is a professional wrestler who participated in a Texas Death match at the Springfield Grapple-arium against The Iron Yuppie. The stipulations of the match are that one man will be unmasked and killed in the ring. It is unknown whether Dr. Hillbilly is a hero or villain, although Homer does wish death upon his opponent, The Iron Yuppie. Modified on October 25, 2011, at 03:31.